In 1999, James Clarke was a quarter of the way through a bachelor’s degree in electrical engineering when he and his family were in a serious car accident. Between working full-time and recovering, he decided school would have to wait. James and his wife, Kim, settled in Washington Terrace, Utah, to raise their family. He had worked for the U.S. Air Force since he was 18 years old and, after 20 years, James began to feel stalled. He was the only person in his department without a bachelor’s degree, and that limited the types of assignments he was given. 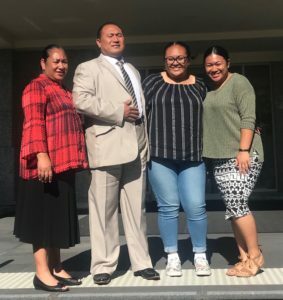 Across the world in Tonga, Meleane Fakahau Fisi’ihoi had a very different life experience from James, but with a similar result — a partially completed university degree and limited job prospects. 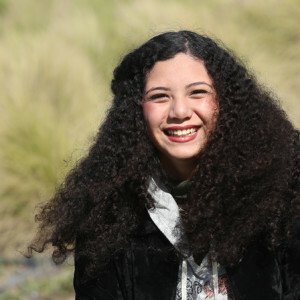 Meleane grew up in poverty and was the only one of her six siblings to finish high school. She dreamed of attending university, but when her mother got sick, her dream was put on hold to help support her family. She eventually moved to New Zealand to attend a nursing program; however, she only completed a portion of the program before her student visa expired. James Clarke studying at home. 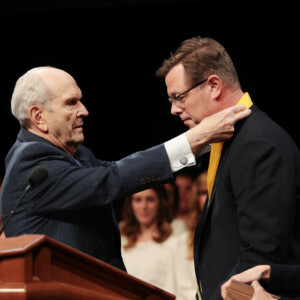 According to BYU-Pathway Worldwide President Clark G. Gilbert, while higher education faces a challenge in providing access to college, it faces a crisis in college completion rates. According to the Pell Institute, more than 58 percent of U.S. students who began a university degree program in 2009 did not graduate within six years. For students who came from the lowest income quartile, that figure approaches 90 percent.2 Compounding the crisis, research shows that as much as 90 percent of the value of a university degree doesn’t come until the senior year,3 after students finish their general education and begin taking advanced, discipline-specific courses. So, in higher education today, nearly all the most vulnerable students are being left behind, accumulating college credits and debt, but leaving without a degree or a clear marketable skill set. In 2017, President Gilbert and teams at BYU-Pathway began working with partners at BYU-Idaho on the difficult task of rethinking and redesigning the typical structure of the university degree — especially for online students. The goal was to significantly increase completion rates, particularly among students in non-traditional circumstances. They also saw a need to improve the outcomes for students who do not complete a degree, helping them to increase their employment prospects earlier in their program rather than just at the end. This required a move away from the traditional university degree model which begins with several semesters of general education courses. The teams found their solution in certificates — typically just five courses focused on a specific skill that can be completed in one year or less. Each certificate stacks directly into a degree and signals a marketable skill set to employers. They worked with BYU-Idaho’s academic departments to redesign each online degree program to begin with a certificate. Degrees are built by stacking certificates — so no credits are ever lost. 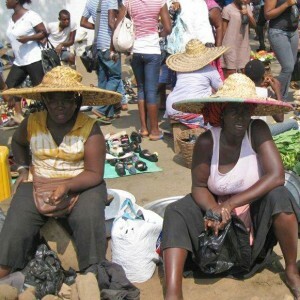 By starting with a certificate first, students start building marketable skills immediately. After the first certificate, an associate degree is built from a second certificate plus general education courses. A bachelor’s degree is then built from a third certificate plus more general education courses. Starting with a certificate helps students immediately get value from their education. Currently, 70 percent of BYU-Pathway students increase their earning potential after they earn their first job-ready certificate. What’s more, students who complete a certificate are 41 percent more likely to continue toward their bachelor’s degree. 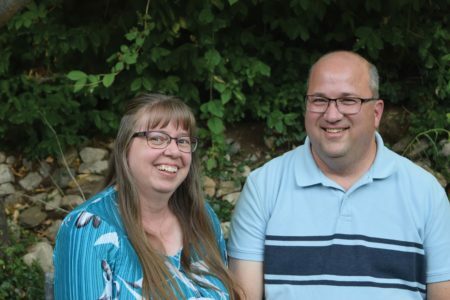 On opposite sides of the world, James and Meleane each found BYU-Pathway Worldwide’s PathwayConnect program. They immediately recognized the one-year, low-cost program as a way to finish the degrees they had started years ago. 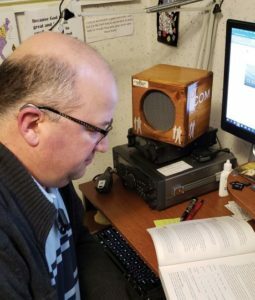 James completed PathwayConnect in 2016 and immediately began work on his first certificate in programming. He will graduate in 2020 with a bachelor’s degree in software engineering. In 2017, Meleane completed PathwayConnect. She inspired both of her daughters to complete the program as well. Meleane has earned her first certificate in marriage and family studies and plans to become a marriage therapist after finishing her bachelor’s degree in marriage and family studies. “For many years, I have been praying and hoping for an online program so I will still be able to work full time and study,” she said. “When I found out about BYU-Pathway and the flexibility, I jumped at the opportunity. Furthering my education in a Church program was the icing on my cake. It’s exactly what I was hoping for and more. Starting with a certificate immediately accelerates the value of a student’s education. If students leave college before completing a degree, they will still have earned at least one marketable credential. Certificate-first is specifically designed to not be certificate-only. Students get the advantages of quickly gaining career-oriented skills while still having the flexibility to earn a four-year degree. General education continues to play an important role, just later in the program. 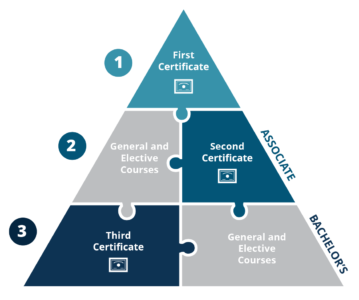 In the certificate-first model, all courses stack toward a milestone so no coursework is wasted and no credit is left behind. BYU-Pathway purposely incorporates meaningful milestones early in the degree-seeking process in order to keep students motivated to continue toward their bachelor’s degree. Certificates are not just 15-credit chunks of degree prerequisites. Instead, the skills gained with certificates are directly connected to potential careers. By keeping the courses skills-based, students can readily connect their education to their career and life after graduation. 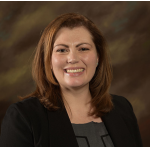 BYU-Pathway’s new degree structure was featured in The Chronicle of Higher Education: “General Education Can Wait, Says an Online-Learning Leader” by Goldie Blumenstyk.